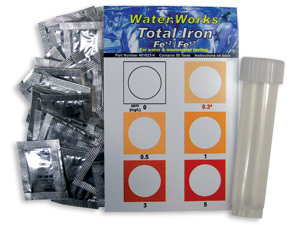 Before the arrival of Total Iron in water test kit from Industrial Test Systems, Inc., detecting total iron at the EPA limit of 0.3ppm typically required the use of a meter or a titration test kit. Looking to test specifically for arsenic in water, lead in water, copper in water, chromium in water, mercury in water, manganese in water, or zinc in water? How about a semi-quantitative metals in water test with a low detection level of 10ppb and an upper detection level of 1,000ppb? Be sure to check out the latest water quality testing information on our Water Testing Blog.